The business community needs to wake up to the challenges of the new eleven super-councils. 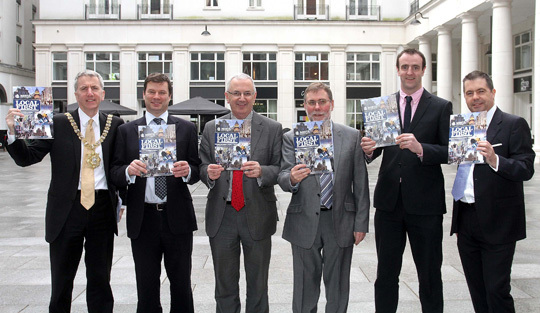 That was the message from the Northern Ireland Independent Retail Trade Association (NIIRTA) as it launched its manifesto Local First, for the Local Government Elections at the MAC this morning. The role of local Chambers of Commerce in the fight for economic regeneration was also flagged up in the report. Local First was launched at NIIRTA’s second Town Centre Summit, supported by Danske Bank, was addressed by the Ministers for Environment, Regional Development and Social Development and also the Lord Mayor of Belfast. The audience included independent retailers, Council candidates and many other key stakeholders. Lord Mayor of Belfast, NIIRTA Chair Nigel Maxwell, DRD Minister Danny Kennedy MLA, DSD Minister Nelson McCausland MLA, DOE Minister Mark H Durkan MLA and NIIRTA CEO Glyn Roberts launching Local First this morning. Speaking at the launch, NIIRTA Chief Executive and author of the report, Glyn Roberts said: “By and large the local business community needs to wake up to the huge challenges and opportunities that the new Councils will offer. They could be the change-makers for economic development, radically new town centres, innovation and urban regeneration. “With their enhanced powers these Councils will be vital players in shaping the future of our economy and it is essential that the private sector engages with party candidates in this election to ensure that they can hit the ground running when power is transferred in 2015. “Our manifesto, Local First is an economic Programme for Local Government, setting out eighty ideas about how the eleven councils, working with the NI Executive, can help to create employment, regenerate town centres, revamp car parking and ensure they adopt a fair planning policy. “This is not just a retail manifesto, but a programme for economic and social change for Northern Ireland. “Given that we still have twice the UK average of shop vacancies, we are bringing solutions, not more problems to the challenges facing our town centres. We want to see our town centres reclaiming their rightful position and role as places that serve their communities, visitors, businesses and key stakeholders, with a quality of experience that encourages them to keep coming back and staying longer. * Digital High Street Strategy for every town centre. Katherine James, Head of Small Business at Danske Bank, said: “The eleven newly created councils will undoubtedly become very important players in terms of driving our economy forward. Danske Bank is forecasting 2.3% growth in the Northern Ireland economy for 2014 and 2.4% growth in 2015. “Despite the obvious hardships that our towns and cities are still facing as we come through recession we are confident enough to say that our economic indicators show that a recovery has most definitely started and is taking root. SMEs are the absolute heartbeat of our local economy and we look forward to continuing to support their growth throughout 2014 and in the years ahead”.